The T-72M1 tank is a crawler combat vehicle having a strong armament, good armour, high manoeuvrability and reliability. The T-72M1 is provided with 125 mm smooth barrel main gun stabilized in two planes of laying the gun, 7.62 mm machine gun coaxial with main gun as well as anti-aircraft machine gun 12.7 mm fitted on the commander's cupola. The T-72M1 tank has the laying and sight means with a high accuracy enabling high hit probability by the first shell. Usability of three types of shells ensures the blows efficiency of all targets on the battle field. The T-72M1 tank is provided with special equipment designed for protection of crew members and inner devices against a shock wave action and radioactive radiation. It has good anti-ballistic guard, which was achieved by using a low silhouette, optimal shapes and multi-layer armour. 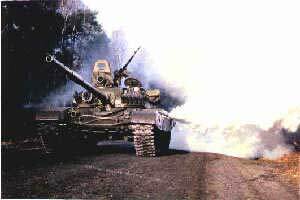 The T-72M1 tank has also the deep fording equipment, smoke screen thermal generating unit, launchers system to generate the smoke screens, fire fighting system to extinguish the fire inside the tank, sending-receiving radio set, interphone and moreover is equipped with attachments for self-entrenching and for making the ways on minefields. 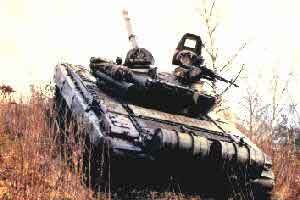 The T-72M1 tank has high manoeuvrability in all climatic and terrain conditions. The Polish Military Institute of Armament Technology (WITU) has developed two types of Explosive Reactive Armour (ERA) which can be fitted to the T-72M1 MBT and also installed on the more recent PT-91 MBT covered in a separate entry. Details of the Polish MBT defensive aids system are also given in the PT-91 entry. The turret of the T-72M1 is protected by 108 blocks of ERA, the hull by 118 blocks and the side skirts by 84 blocks, giving the vehicle a total of 394 blocks of ERA. These ERA blocks are of a different shape and design from those in the Russian Federation which have a much tighter fit. There are two types of explosive reactive armour blocks, ERAWA-1 (with one layer of explosive inside) and ERAWA-2 (with two layers of explosive inside). According to the design authority, these reduce the penetration capability of advanced shaped charge rounds by between 50 and 70 per cent, with the actual figure depending on the incidence angle of the shaped charge jet on the armour surface. The armour package is insensitive to 7.62 mm, 12.7 mm and 14.5 mm small arms fire as well as cannon fragments between 20 and 30 mm. Only the ERA block hit by a HEAT round goes off with the adjacent blocks being damaged or torn off. Although designed for the T-72M1, this armour package can also be fitted to infantry fighting vehicles, for example. 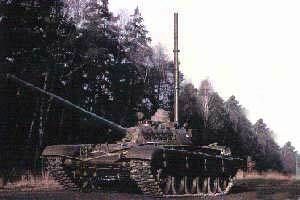 The Wolf (or Wilk in Polish) is the locally built T-72M1 MBT fitted with a PCO day/night passive gunner's sight, a PCO passive night driver's periscope, a new communications system, two-layer explosive reactive armour, new side skirts, an uprated diesel engine, fast reacting fire extinguishers and a laser warning device coupled with smoke grenade launchers on either side of the turret. 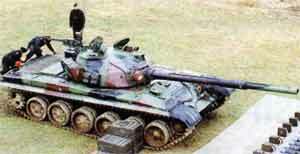 Further development of the Wolf resulted in the PT-91 MBT. This vehicle is basically the Polish T-72M1 MBT fitted with the South African LIW, a Division of Denel, Tiger computerised fire-control system which enables stationary and moving targets to be engaged with a high probability of first round hit while the T-72M1Z is moving. Other improvements, which are also incorporated in the latest Polish PT-91 MBT, include the installation of a more powerful S12U 850 hp diesel engine, laser warning system and the Polish-developed ERAWA-1 and ERAWA-2 explosive reactive armour package. The T-72M1Z MBT has been tested in Malaysia, Poland and South Africa and is one of the contenders for the Malaysian Army requirement for a new MBT. 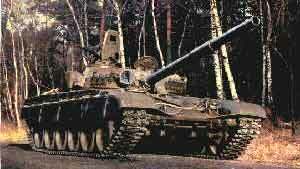 As of early 1999 the T-72M1Z upgrade remained at the prototype stage. Further development of the T-72M1 in Poland has resulted in the more recent PT-91 MBT covered in a separate entry. This istheT-72M1 fitted with a second short-wave radio set with a maximum range up to 50 km, a combined stub antenna 3 m high, a navigational device serving for continuous automatic elaboration of geographic coordinates of points and a generating set. This is the Polish-built T-72 MBT chassis fitted with a launching system and bridge similar to that fitted to the Slovakian ZTS MT-72 armoured bridgelayer which is described in detail in Jane's Military Vehicles and Logistics 1999-2000, page 124. The scissors type bridge has a total length of 20 m and can span gaps up to 19 m.
This has been based on the T-72M1 MBT chassis and is armed with a 12.7 mm machine gun which is fitted to the tank commander's hatch. Standard equipment includes a TD-50 crane with a telescopic jib that can lift a maximum load of 15 tonnes, front-mounted stabilising/dozer blade, main and secondary winches, fire detection and suppression system, smoke grenade dischargers, the capability to lay its own smoke screen and an NBC system. It normally has a crew of four and weighs 42 tonnes. The WZT-3 is in service with the Polish Army and a quantity has also been built for the Indian Army. This is also referred to as the SJ 09 Training Vehicle and is used to train T-72M1 driver/mechanics in how to drive and operate the vehicle as well as carrying out maintenance. The turret has been replaced by a fully enclosed rectangular observation cabin with seats for the instructor and other trainee drivers who can then observe the driver being trained. A simulated gun is provided. Two versions are available. Version 1 has full equipment and version 2 enables existing T-72M1 MBTs to be refitted to the SJ 09 standard.